My quest for a summer maxi dress has been long and arduous. And I still don’t have a dress! The original pattern from this post, had been misplaced. So I had to start over with the looking for a pattern thing. After about an hour of online and in store searching, I decided on this top from Simplicity. I like the Khaliah Ali designs, as they tend to be a little more generous in the bust area. I do like the detailing in this top, and even though I’m not usually a raglan sleeve fan, I like them more than dolman sleeves. Which seems to be around a LOT in the books at the moment. Before diving into my planned material, a trial run was in order. After the hours spent on getting the pattern adjusted (I have to do a full bust adjustment in anything I make), I cut into some gorgeous sage green light jersey that I had in the stash. 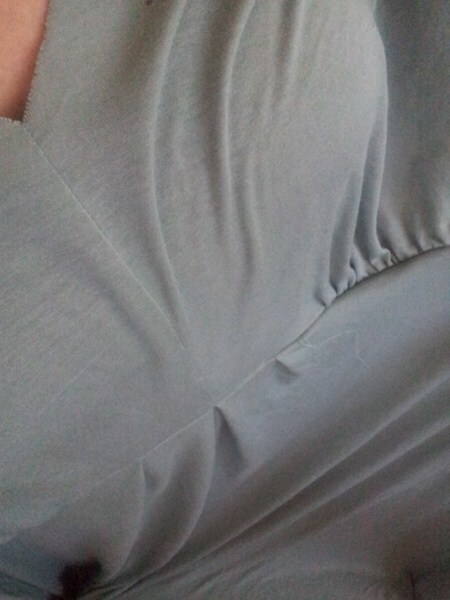 It’s soft, drapey and would have been wonderful to wear…. that is, if it hadn’t been a complete nightmare to sew with. The second it was cut, the fabric lengthened by at least 2 inches per piece. The next 4 mornings were spent with my MIL trying to fix the enormous beast. All that is left is under arm and side seams and hemming… but I had to stop and sew with something that was more delightful. I bought a roll of fabric from the Fabric Cave at the Crowle Foundation, it seems to be a poly/cotton blend. It has cut beautifully (and predictably), sewn beautifully, and taken to minor adjustments fantastically. There has been as much done in ONE session (about 4 hours) with the navy fabric, as what has taken a week to do with the nasty green stuff. I really think the pattern we finalise with the blue fabric will make some gorgeously fitting tops. HOWEVER, this would still be too smooth an adventure if everything went ok from here… right? So as this is a MIS-adventure, let’s through in a curveball. MIL suggested that maybe this pattern was more trouble than we needed to take for the knitted fabric, which after all is what my dress will be made out of (eventually). So the hunt began AGAIN for a suitable pattern. Thankfully I still had my shortlist of patterns from round one. This is a simple empire waist dress with an option for sleeves. Please don’t ask me why I didn’t just get this one in the first place. Starting Monday, we make the adjustments on this pattern and get this puppy whipped up quick! Hopefully by next weekend I’ll have 2 new tops and a new dress! Wish me luck!